As Winter Break approached, I knew I needed to incorporate activities that engaged my students. 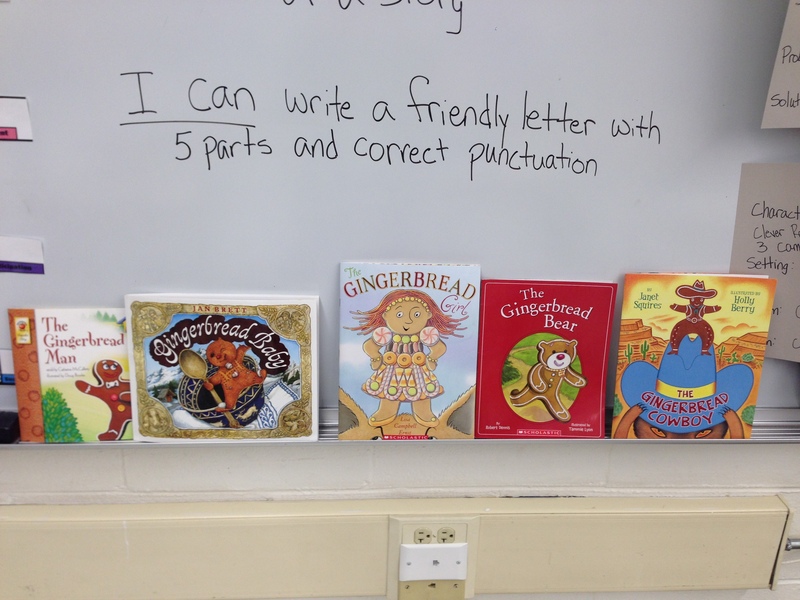 Since I have multiple versions of The Gingerbread Man, I decided to read a few, have the students compare and contrast versions, and incorporate writing activities. This was seen as fun by the students (they looked forward to a new story each day) and incorporated learning standards as well! I started by reading the original Gingerbread Man so we knew the basic story. After reading the story, we created a short summary. We then read 4 other versions, and I had more stories available for students to read during independent reading time; I also gave them access to QR codes to listen to stories on their iPads (this was definitely a hit). After reading each story, we summarized each. This allowed us to begin comparing and contrasting the characters, setting, and plot. After reading the different stories, students worked with a partner to compare and contrast 2 different versions of The Gingerbread Man. They worked hard, used the books to check details, and came up with great ideas! Additionally, they wrote a letter to the Gingerbread Man giving him advice how to prevent being eaten. This was challenging for some to take the perspective of another character. 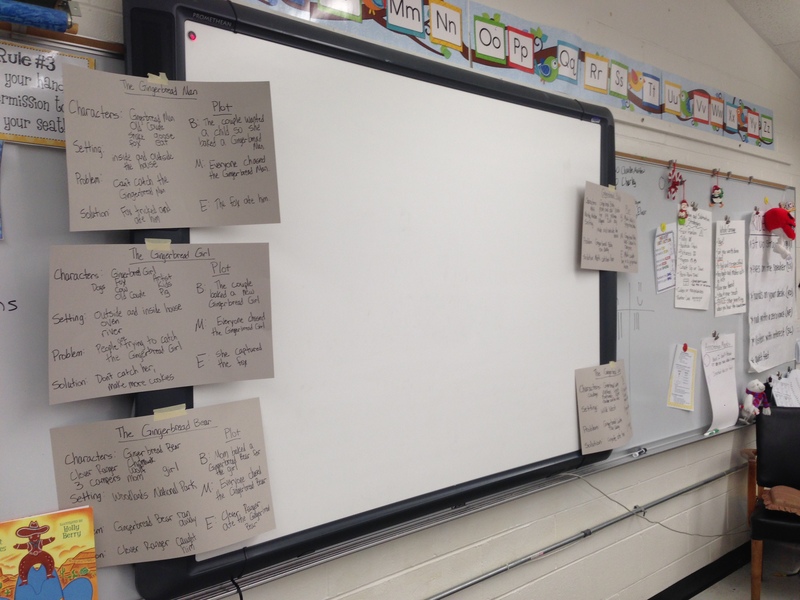 Finally, students had the chance to write their own version of a Gingerbread Man story. They were very creative coming up with characters and setting. It’s fun stepping back and watching the students be excited about their learning! Overall, I would say this unit was a success. Next time, I’m going to have more copies of the books accessible for students to read and use for text evidence during the activities. It’s fun to do something different for a change of pace for both me and the students. I have different versions of more fairy tales and folktales I hope to share with them later in the year! As the year turns to 2015, it’s a perfect time to reflect on everything that has happened over the past year. For me, there have been many positive changes, both personally and professionally. As I have adjusted to my new role (well not so new anymore) as a second grade teacher, I’ve worked to find a balance between my work and professional life. After spending the last school year not in the main teaching role, I’ve realized again why I love teaching and being in the classroom. I love being the teacher, leading the students, helping them discover and learn new things. While there are times I joke I’m tired of hearing my name, at the same time, I love it because it means the students want to share their ideas or need my help. Getting back into the classroom has been a whirlwind-setting it up, getting to know my students and other staff members, learning the curriculum, gathering resources. It’s easy to get caught up in the here and now and the endless piles of work; I always feel like there’s something more I could or should be doing. At the same time, I need to take a step back and realize how much I’ve done and how much my students have already learned. 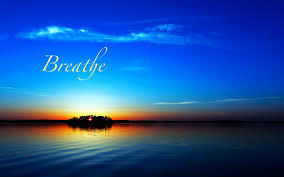 If I had to pick a one word for 2015 it would be “breathe”. When I hold my breath, I don’t enjoy the moment; I’m too stressed about what else I have to do. Winter break has allowed me to relax and rejuvenate. I fresh energy to begin the school year again. Yes, there’s still things I need to learn and things I want to change to make things run smoother in the classroom and continue energizing the students, but by staying in the moment, we’ll all be more relaxed. Here’s to a 2015 where I breathe and enjoy the ride.